Michael Todd addresses the school board with concern and recalls his daughter's incident with bullying in which she was attacked and the video taped altercation was posted on the internet. OSWEGO, NY – In the wake of multiple bullying incidents that have been brought to light at Oswego High School, a group of parents banned together to rally for answers as well as stricter policies and consequences for bullies. 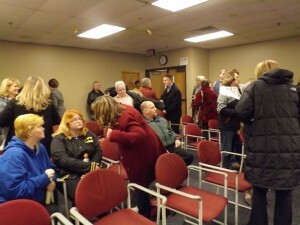 The rally members came in the form of parents, family members and even a student that was bullied herself to face the board members and district superintendent to address the issues of bullying that they believe have become so predominant in Oswego City School District. The first parent to approach the board of education Monday night was Micki Losurdo, addressing the board on behalf of her son who she says is a high functioning autistic child with no disciplinary record and a high honor roll student. 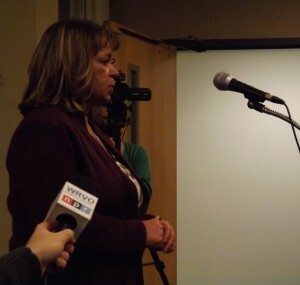 Micki Losurdo approaches the Oswego Board of Education with concerns regarding bullying after her son was “brutally attacked” at Oswego High School. “He was brutally attacked and I don’t feel at this point that we have gotten to where we need to be as far as addressing this issue,” she started. 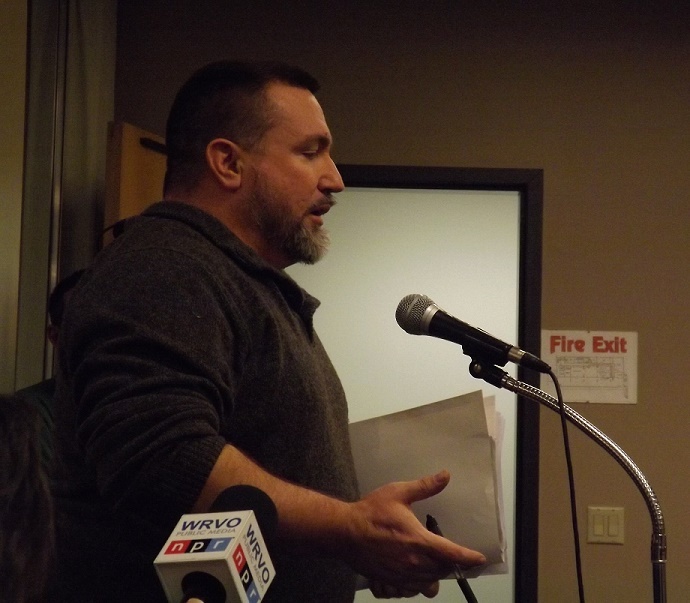 Since the public comment portion of the board meeting does not act as a conversation (it is just a form for the public to address the board), Losurdo will not receive immediate response from any member of the board of education. This portion of the meeting gives the public a chance to address the board without an instant response from the board or superintendent. One parent, Michael Todd said that his daughter was attacked by multiple bullies in a premeditated assault in December of 2015. “Since that happened there has been some go around as to what the DASA requirements are and evidently there is some confusion on it, so in talking to the DASA people and printing out all the stuff, I’m going to let everybody know that is not aware,” he said. The Oswego Board of Education hears from a group of parents and family members of bullied students looking for change in the school policies in response to bullying. Todd went on to inform the board and audience that under the DASA requirements, any school employee that is aware of or witness to any bullying, discrimination or harassment is required to orally notify the principal, superintendent or their designees no later than one school day after the incident is seen or an incident is reported to them. He continued that a written report must be filed to the principal, superintendent or designees no later than two school days after the incident is seen or an incident is reported to them. “No place at all in DASA in talking with the state is there any requirement that the parent or student have any obligation to fill this out. In addition to that, the one form that is not on your school district website for anyone to fill our is a DASA form,” he explained. Todd said that the sole responsibility is on the teachers and administration of the school as they are the ones given training in these areas. Todd claimed his daughter went to the administration six times in the week leading up to the attack and that he believes it was a premeditated attack, as it was posted online before it was going to happen. He noted it took the substitute teacher that day 53 seconds before security was notified, as shown in the video. Todd was upset to see that both students that committed the attack on his daughter are back in school and the student who helped plan the attack, videotaped the altercation and posted it online is back in school and playing on the basketball team. He brought up four other cases of bullying in which four other videos have been made involving a bullying altercation in the high school and said they, being all parents and family members involved, are looking for policy changes. He doesn’t plan to stop at this school board meeting, however and he has already taken steps to involve higher levels of office into the investigation of his daughter’s attack. “The state board of education has been notified, they’re doing an investigation now. The state attorney general’s office is now looking into it and a request was made on Thursday to the US attorney’s office because it goes to DASA that they now come in here and investigate this,” said Todd. Michael Todd addresses the school board with concern and recalls his daughter’s incident with bullying in which she was attacked and the video taped altercation was posted on the internet. She claimed that if a school employee had notified the principal or school security of the bullying that had been ongoing, the situation would not have escalated to a physical altercation. “The school really needs to step up and do something with the bullying situation because its out of control, big time,” she finished. An aunt of the same student then addressed the board in response to her nephew’s experiences with bullies at the high school. She said they were able to watch a video while at a superintendent’s meeting in which she watched a school bus driver stand on the steps of the bus, allow a student to get off the bus and attack her nephew while she continued to stand on the bus steps and watch. “That’s not right, it should be equal for every child in that school and not just who you deem to be accessible or who you deem to be a good child. That’s not your decision to make, you’re supposed to be unbiased teachers and supervisors of these children who are supposed to look out for them. Yet I have not seen that done at all with all of these videos that are posted,” she added. After the board meeting had concluded, Superintendent Dr. Dean Goewey spoke to Oswego County Today in response to the parents’ efforts to reach out to the district regarding an issue with bullying. The Education Center meeting room was filled with parents, family members and concerned community members to hear the rally against bullying in Oswego City School District. While Dr. Goewey understands that there is no arguing with these isolated incidents, the school district does take a proactive approach to bullying. “We do a lot of proactive things in our district. We have the PBIS system which is a proactive approach to positive behaviors that starts in kindergarten. We also have a lot of initiatives built into the school improvement plan at the Oswego high school because my focus since I was the assistant superintendent has been on the social, emotional developmental health of the kids,” he said. Through his years in education working at different positions at different levels of education, Goewey affirms that his sole focus has always been on the well being of students and their educational experience. In regards to the specific DASA regulations addressed at the meeting, Goewey believes he and his administration and staff are well versed in this area. Despite the opinion of many parents as exemplified in the public comment portion of the meeting, Dr. Goewey believes the high school principal and staff have done well in response to bullying incidents. “In all fairness, Dr. Sweeney, who is our high school principal, knows DASA quite well and has had extensive training. Anything she’s done to document was born of her understanding of DASA,” he said. This school board has spent the past year raising taxes by 10% and then congratulating themselves for making Oswego into a “flagship district” (whatever that means…) These school board members need to stop patting themselves and the administration on the back and start holding people accountable without passing the buck to taxpayers. These are kids lives at stake. I don’t care if Dr. Sweeney’s job is not always easy she is paid extremely highly by the taxpayers, so she needs to be held accountable as does Dr. Goewey. Agreed my son can see this in middle school, nor looking forward to high school. Something needs to change, before something far worse happens, and if doesn’t change it is coming. I pray everyday for these children in our school district right now. Keep going Public as that is the Only Way to force Districts to do their JOB………rather than the standard Sweep it Under the Carpet mentality Permeating School Administrations, Faculty, & Staff. I went here when I was younger and I was bullied. I was told by the principal at the time that I should tell the girls bullying me that I would get expelled if they were to hit me. Where the logic is in that I’m not sure. I still to this day don’t see how I would have been in trouble for defending myself against them. It was ridiculous then and it continues to get worse through the years. I’m happy to say my kids don’t have to go to that school ever. As the mom of a special needs child I am a bit worried as it seems some special kids are being singled out….? My daughter already has issues with bullies (6th grade), but luckily, after multiple meetings, the school is starting to do something. Bullying is happening at Charles E Riley, and the principle there is doing nothing about it. Kids there are getting beat up and being verbally abused by other students. Praise God parents are taking a stand. Evil exists when good men do nothing!! One of the problems within the district is the lack of security officers doing what they’re supposed to be doing. They buddy-up to their favorite students, and the kids have no fear of them. The school board needs to hire an outside firm, or go back to having police officers in each building. Allowing a student who has been bullying another (or others) back on a sports team is wrong. When there are no consequences for their actions, these students will keep bullying. My daughter also goes to Riley. I’d love to talk with you! I am so glad my family moved from this area as a child. Having parents stand and fight the battles that form adolescence in a child, and help build self worth. I have a five year old and would be ashamed of my self if i did not teach and or help my child understand what or how to stop this him or herself. Your children’s teachers are just that. how about you be the parents and teach some self defense or misdirection tactics. Attitudes like this weaken our society so badly…..
Nobody should expect answers from the board of education. This board under President Kathleen Allen for the past 3 years has become the rubber stamp board. Check out the meeting minutes. 7-0 votes on every agenda item. Tax increases galore. They do not question the administration or hold them accountable. 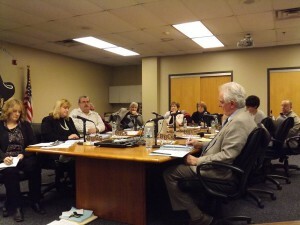 They show up to the board meeting, rubber stamp all items, no discussion, and they are done. They aren’t here to make the system any better, safer, or more efficient. Maybe in May people need to pay attention at election time and toss off the ineffective incumbents. Bullying by definition is a continued act – many of the things being discussed are events that occurred infrequently and should be deemed an act of violence which is punishable by law. Teachers are stuck which many of you have forgotten – they are not defended by their administrators when they try to split up a fight or argument – because A- their administrator throws them under a bus or B – the parent threatens to sue them because they had to put their hands on a child to separate them. Why not put yourself in their shoes before you cast the stone. You are also forgetting that their is not a resource officer readily available in each building. If you wish to lay blame – administration is your first blame. It is their responsibility to punish, investigate, follow up, and follow through – not the teacher. But I will tell you as a retired teacher many administrators will not follow up or look into things either, do not wish to be bothered or many of them are called to so many meetings they are not in the building. We cannot solely blame the kids for the actions that are happening. They are acting on what they have been taught and what they see throughout their lives. For example, my son used to be a student at CER and was being bullied BY THE TEACHER, therefore causing the students to bully him. When my FIRST GRADER has a file thicker than most college term papers, that’s a call for concern. Yes, policies need to be reviewed and the administration needs to be held accountable for the things they are allowing to happen throughout the district, but there also needs to be a look into the teachers and the way they handle a classroom. We have since transferred schools (within the district) and have since had no issues with my son. Some of the worst bullies when I was a student had parents who taught in the schools. Many of you may not be aware that the district allowed these parents to determine who procured positions in the Wind Ensemble and other extracurricular positions. In 1986 the teacher parents decided to have an 8th grade dance at OMS held at OMS that EXCLUDED the majority of the graduating 8th graders. Look it up; this is not an exaggeration. Back then, parents were upset, but no one filed a complaint because this type of classicist behavior pervaded the district. They created The Academy in the late 80s with the help of Mr Noun (a great teacher) to help those kids falling through the cracks who felt disenfranchised and rejected at school. BOCES took it over in the late 90s. Why however should a small city of 19K need an alternative school? As is evident, the system is broken and the administration is liken to Nero; who fiddled while Rome burned. So where do kids turn to if the teachers are bullies or turn a blind eye to bullying? The district is an embarrassment both in terms of academic rigor (having recently had the lowest state exam success rate) and in terms of monitoring student behavior. PBIS only works if everyone: teachers, administrators, parents, and students are on board. Sadly, this district has done a disservice to the community. As a former teacher and now administrator myself (not for Oswego), I’m appalled by the lack of action that has taken place that would have prevented many of these crimes. Because they are indeed crimes and should be treated accordingly. I hope NYSED gets involved and takes serious action before a child is fatally assaulted. The emotional scars that are left are far greater than the bruises that fade. I applaud the parents. Do not give up or give in. I am the parent of one of these children who have been bullied and assaulted. This Superintendent took 18 days to contact me after the assault even though I called him the night of the attack asking him to be there in the morning at the high school to meet with me and the principal. I am glad he did not show up because I probably would not of learned everything that I did learn about my son’s premeditated attack. I am vigorously pursuing accountability on this school district and I will not stop until this district complies with DASA and Federal laws. Unfortunately I know more about education laws than I want to because of my son’s autism and I know when they step out of line. I do not care about them circling wagons, brushing things under the rug or who has their feelings hurt. I have heard from so many parents that it is weighing heavy on my heart. This is not just happening at the high school, it is throughout the district. As far as I am concerned this whole situation is going to see the light and if this district can’t help themselves I will seek help for them. They may not want it but they are going to get it. They have a job because of our children and they have obligations to protect our children while in their care. There are poorer school districts who have less bullying and higher graduations rates than Oswego. Maybe the district here should take note of that and adopt some of those policies. Pull your heads out of the proverbial you know what and do something meaningful. Quit deleting evidence and do your jobs as DASA intended. I am not letting this go and I know several other parents have said the same thing. It is time for change and cleaning this mess up. My daughter was bullied by a teachers daughter. I spoke with the girls mother and the mother basically threaten me. The next day, I went to the Middle School and I was told that because me daughter didn’t report the incident that day, they couldn’t do anything. This teachers kid continued to try to bully my daughter via social media. I called the parent, again, and let her know what was going on and that was the end of it. Parents, what helped my daughter was to explain to her that some girls become jealous if they see something in someone that they wished they had. My daughter wasn’t scared by the bullying, she felt sorry for the girl who was bullying her because she knew that she was unhappy in her life. My daughter is in college and finishing her bachelors in nursing. She is a beautiful, kind and happy person. I am so sorry to hear that bullying has gotten worse and I wish all the kids and parents the best. There is a new bully shutdown system finishing development right now that provides parents with the leverage and power to shut down bullying in their schools. If any of these parents would contact me I would be more than happy to share this information with them. My number is 803-479-2241.